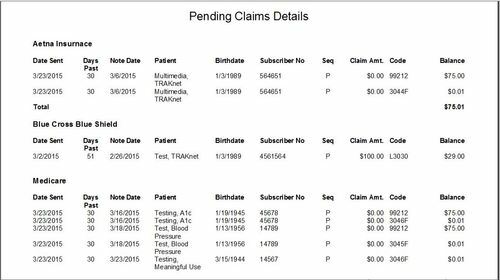 The Pending Claims report is a standard billing report found under the Billing Dashboard, in Reports. This report will give you an overview of what claims are currently outstanding to insurances. Each claim office that a claim was sent to will be listed separately on the report. This report lists the charges that have been submitted on the claim history, not the charges themselves. If the charge has been paid off, it will not show. If the charge was submitted again without the previous claim history being deleted, it will show twice on your report. This report is aged based on days since the claim was submitted. 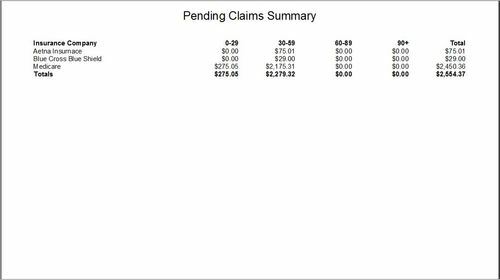 Summary – shows each insurance company that currently has monies outstanding with that money broken down by aged date range. Totals for each insurance company and overall totals are provided as well. Detailed – broken down by each insurance company with the individual charges listed below. This includes the day that claim was sent, how many days it has been since, the note date, the patient’s name along with their birthday and subscriber number, the insurance sequence, the treatment code and the current balance on the charge. The phone number of the insurance company is also provided. This is the information for the parent company; the claim office for the claim is not on this report. Totals outstanding for each insurance company are provided below the patients. Claim Date – only charges where the claim was sent out during the specified date range will be included. Days Past Submission – only charges where it has been the specified number of days since the claim was sent out will be included. Insurance – only claims for the specified insurances will show. Note Date – only charges where the Encounter charge’s date is within the specified date range will be included. Show Submitted Charges – if “True” is selected, only charges that were actually submitted will appear. If “False” is selected, any charge that was not submitted, but is on the same invoice as a charge that was submitted, will show. A sequence will still be displayed for these charges. This sequence references the sequence of the other charges. If one of the submitted charges is awaiting a primary payment, and another one is awaiting a secondary payment, the unsubmitted charge will show next to both and will be duplicated on the report. Likewise, if you have a claim that was split and one charge was sent to one insurance and another charge was sent to another insurance, the unsubmitted charge will show next to both of them if they are on the report. Show Patient Responsible – if “True” is selected, patient responsible charges will be included in this report. If “False” is selected, they will be left out. This filter will combine with the Submitted Charges filter. Locations – lists only charges that were rendered at a specified location. This is based on the location set for that Encounter on which the charge is located. Provider – lists only charges that were rendered by specified provider(s). This is based on the provider set for the Encounter on which the charge is located.